A STATUS ORANGE snow-ice warning has been issued for six counties tonight. Met Eireann has issued the warning for Cavan, Monaghan, Donegal, Longford, Leitrim, Mayo and Sligo. It became valid at 4pm today and will stay in place until 6pm tomorrow. 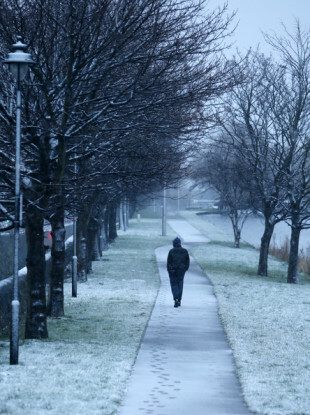 Met Eireann says, “Snow showers will occur this evening, tonight and during Friday. Accumulations of 4 to 8 cm expected, with the larger values on high ground. Icy roads and footpaths. A status yellow snow-ice warning is also in place for Munster, Dublin, Carlow, Kildare, Kilkenny, Laois, Louth, Wexford, Wicklow, Offaly, Westmeath, Meath and Roscommon. Snow showers are expected for the counties which icy roads and footpaths. It will also be valid until 6pm tomorrow, with accumulations of up to 3 cm expected. Email “Status Orange snow warning issued for seven counties ”. Feedback on “Status Orange snow warning issued for seven counties ”.